A slow-paced lifestyle and sultry Provençal charm make Aix-en-Provence an appealing tourist destination. Bathed in the sunshine of its wonderful climate, the beauty of Aix-en-Provence is visible everywhere - especially in its lively streets and squares. In summer, languid days are easily spent strolling the shady boulevards. The balmy evenings are perfect for sitting at outdoor terraces and cafés. Aix-en-Provence has an elegance that reflects its noble heritage. Known as the "City of Counts" because the Counts of Provence once lived here, Aix-en-Provence has several impressive old aristocratic palaces. There are also hundreds of fountains; Aix-en-Provence is called the "City of a Thousand Fountains." The city boasts two interesting historic areas: Vieil Aix and the Mazarin quarter divided by the beautiful avenue Cours Mirabeau. Other cultural attractions include the world-class Garnet Museum, Cézanne's art studio, and a trail of sites that Cézanne frequented. One of the most enjoyable aspects of visiting Aix-en-Provence is wandering the charming streets and squares of Vieil Aix. At the center of the Old Town is the Place de l'Hôtel de Ville. Visitors may begin a tour at this square to admire the 17th-century town hall building with its beautiful Italian-style façade and ornately carved wooden doors. Another monument on the square is the 16th-century Tour de l'Horloge, the old city belfry with an astronomical clock from 1661. Like most squares of Aix-en-Provence, the Place de l'Hôtel de Ville is adorned with a monumental fountain. The square is also where the colorful flower market is held on Tuesday, Thursday, and Saturday mornings. A walking tour may continue along the Old Town's peaceful streets and quaint cobblestone lanes to the Place d'Albertas. This 18th-century square has a special Old World charm. Surrounded by elegant Baroque and Rococo buildings, the square was completed in 1745 for the Marquis d'Albertas and designed in the style of royal squares in Paris. The square features a simple fountain that dates from 1862. On the south side of the square stands the Halle aux Grains (former grain market now the post office) with a magnificent gable that was built in 1759-61 and embellished with sculptures by Jean Pancrace Chastel. Perhaps the liveliest spot in Aix-en-Provence, the Cours Mirabeau is a graceful avenue shaded by giant plane trees and lined with cafés, restaurants, and boutiques. This pleasant promenade (once used for horse-drawn carriages) is the perfect place for a leisurely stroll, an alfresco lunch, or a coffee stop at an outdoor terrace. Many locals meet here after work to bask in the late-afternoon sunshine and relax in the early evening. One recommended establishment is the celebrated Brasserie Les Deux Garçons, located at 53 Cours Mirabeau. Since 1792, this brasserie has offered classic French cuisine served by a polished wait staff in a sophisticated dining room. Illustrious patrons of the Brasserie Les Deux Garçons have included Cézanne, Picasso, Piaf, and Camus. The Cours Mirabeau links the Old Town with the Mazarin district. It's worth taking time to admire the 17th-century and 18th-century mansions, such as the Hôtel de Forbin (number 20), built in 1656, and the Hôtel de Maurel de Pontèves (number 38), built from 1647 to 1650. In keeping with Aix-en-Provence's fondness for fountains, several embellish the Cours Mirabeau. The monumental fountain at the west end, the Fontaine de la Rotonde, features a statue of the Three Graces, bronze lions, and multiple tiers of splashy waterworks. At the east end stands the 19th-century Fontaine du Roi René, commemorating the beloved king who reigned over Provence, Anjou, Lorraine, Piedmont, and Naples in the 15th century. 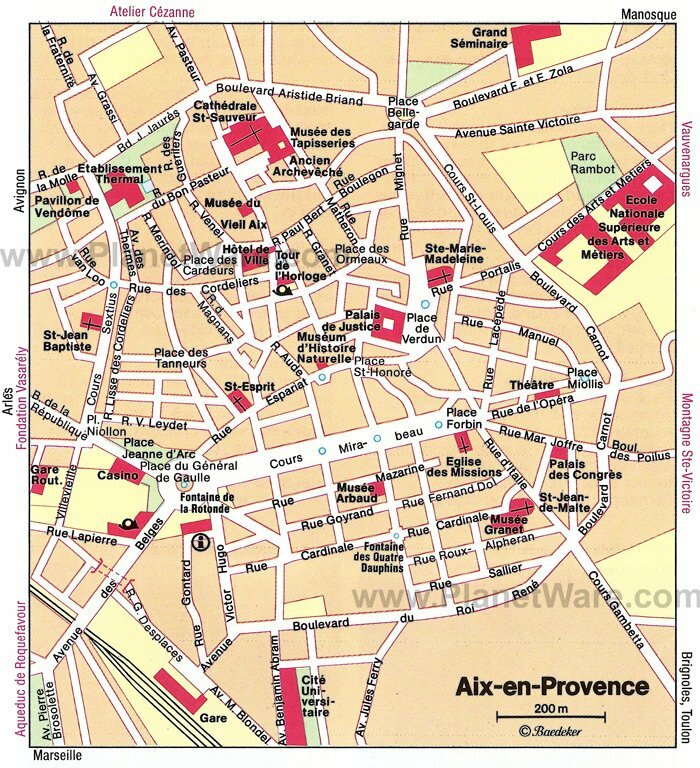 In Aix-en-Provence's historic center, the Quartier Mazarin neighborhood was originally developed beginning in 1646 by Michel Mazarin, the archbishop of Aix and brother of the famous cardinal and politician. The perimeter of the quarter can be traced to the Old Town walls, along the Boulevard Carnot and Boulevard du Roi René, following rectangular lines characteristic of 17th-century town planning. At the center of the Mazarin district is the Place des Quatre Dauphins with the Fountain des Quatre-Dauphins, created in 1667. This whimsical fountain features sculptures of four dolphins spouting water. The square has several private mansions, including the Hôtel de Boisgelin with a fine coach yard decorated with monumental friezes. The Saint-Savior Cathedral is a unique monument because it was built over a large span of time, from the 5th to 17th century. The blend of architectural styles is evident in the facade, which features Roman, Romanesque, and Gothic elements. Upon entering the Romanesque doorway, visitors are awed by the serene beauty of the Merovingian Baptistry from the early Christian era, featuring a pleasing round shape and classical columns. The cathedral has three distinct naves (Romanesque, Gothic, and Baroque) reflecting the continuity of building construction through the various centuries. On the right of the main nave is a famous 15th-century Burning Bush triptych painted by Nicolas Froment (which is only on display during scheduled dates in the spring and summer). Further exploration through the left wing leads to a portrayal of Good King René created from 1434 to 1480. In the nave and south aisle are exceptional Flemish tapestries, and behind the High Altar is the Chapelle de Saint-Mitre, dedicated to the patron of the town. Visitors should be sure to see the cathedral's Romanesque cloister, an exquisite space that offers a sense of tranquility to inspire spiritual reflection. Housed in the former Palace of Malta just off Rue d'Italie near the Cours Mirabeau, the Granet Museum is considered among the finest art museums of its kind in France. The museum boasts an extensive collection of paintings from the 14th to the 20th century, including pieces by the great masters Géricault, Ingres, and Rubens. The museum has an exceptional assortment of Impressionist art, especially the paintings by Cézanne, as well as works by Degas, Monet, and Van Gogh. The Post-Impressionist and modern art movements are also represented with pieces by Bonnard, Braque, Dubuffet, and Picasso. In addition, the Granet Museum hosts world-class exhibitions throughout the year. This exceptional museum displays a collection of tapestries from the 17th and 18th centuries, as well as contemporary textile art. Highlights of the museum's collection include tapestries from Beauvais featuring scenes from "Don Quixote de la Mancha" by Cervantes. The museum occupies the Palais de l'Archevêché (former Archbishop's Palace) near the cathedral. During the summer, the courtyard of the palace is used as an outdoor theater for the internationally renowned Festival d'Art Lyrique d'Aix-en-Provence (Opera Festival). Admirers of Paul Cézanne will enjoy a visit to his atelier, to get a sense of his work space and see where his creativity took shape. A visit opens the door to Cézanne's private world and illuminates his artistic genius. The artist worked at this studio with great intensity throughout the year. On sunny days, he painted outdoors at the scene. On rainy days, Cézanne would stay inside his atelier and paint ordinary objects for still life paintings: bottles, pottery, vases, flowers, and fruit. Many of Cézanne's renowned works were painted in this studio. Fondation Vasarely was created in 1976, and the building itself is a stunning work of modern optical art, befitting the pieces displayed inside. In this unconventional building, visitors can see 44 huge wall-paintings, "integrations murales," and hundreds of studies by the Hungarian-French artist Victor Vasarely, who was part of the Abstract Constructivist school of painting. The foundation also hosts temporary exhibitions throughout the year. The Vasarély Foundation is located outside of the center of Aix-en-Provence on the Avenue Marcel Pagnol in the Jas de Bouffan district. Surrounded by French-style gardens not far from the city's historic center, this elegant 18th-century residence was built for Louis de Mercoeur, the Duke of Vendôme. The pavilion is considered one of the loveliest "follies" (pleasure houses) from the Grand Siècle (the 17th century). A place of peace and beauty, the Pavillon de Vendôme reflects the splendor of a bygone era. Open to the public as a museum, it displays exhibitions of modern and contemporary art. The sumptuous mansion also contains everyday objects, paintings, and furniture from the late 17th and early 18th centuries, which allow visitors to imagine the lives of the people who once lived here. Outside of the historic city center, about a ten-minute walk from the Atelier Cézanne, this beautiful hillside site was popular among Impressionist painters including Cézanne. Now a public park, the Terrain des Peintres exemplifies the characteristic terrain of the Provençal landscape with an exceptional view of the Mont Sainte-Victoire and a contrast of colors so typical of the countryside. Cézanne would set up his easel here on the Chemin de la Marguerite, where he would paint the Sainte-Victoire Mountain and surrounding landscape. In many of Cézanne's paintings of Mont Sainte-Victoire, it is easy to recognize the pathways, shrubs, and red-roofed houses that are still visible today. The Terrain des Peintres is a wonderful place to take a leisurely walk and to soak up the inspiration of Impressionist artists. For art lovers, one of the most rewarding things to do while visiting Aix-en-Provence is to explore the city in the footsteps of Cézanne. A pedestrian route known as the Cézanne Trail begins with the statue of Paul Cézanne at the Cours Mirabeau, continues with landmarks such as the school that the artist attended as a child, the building where he was born, the houses of his friends, the cafés where he met other artists, and the church where he married his wife Hortense Fiquet. The city of Aix-en-Provence has indicated the most important Cézanne locations with a trail of studs (nails shaped like the initial "C") on the pavement, allowing visitors to take a self-guided walking tour to see the places once frequented by Cézanne and appreciate how he experienced the world. Visitors can pick up a brochure listing the Cézanne Trail sites from the Atelier Cézanne or from the Aix-en-Provence Tourist Office. It is also possible to take a guided tour of the Cézanne Trail, offered by the Tourist Office. La Maison d'Aix: boutique luxury, personal service, stylish decor, fresh flowers, underground spa with hammam and pool. Adagio Aix-en-Provence Centre: mid-range apartment hotel, near the old town, chic decor, kitchenettes, multilingual staff. Hotel Cezanne: affordable boutique hotel, modern decor, free minibar, Nespresso machines. Ibis Aix-en-Provence: budget-friendly rates, sleek decor, outdoor pool and sundeck, clean rooms. A symbol of Provence, the Sainte-Victoire Mountain is known as Cézanne's muse. Located about 25 kilometers from Aix-en-Provence, the mountain reaches an altitude of 1,011 meters and dominates the surrounding scenery. The area has pleasant paths that are designed for nature walks and gentle rambles. Along the way are several sites of religious heritage: the 17th-century Sainte-Victoire Prior; the Saint-Ser Hermitage, a tiny chapel in a cave (to preserve the memory of a 5th-century hermit who sought refuge in this place); and the Cross of Provence, perched on the western tip of the massif. From the Pic des Mouches, the highest point, the perspective stretches out over the rolling plains of the Aix region. On a clear day, the vista affords glimpses of the Mediterranean Sea and the French Alps. Outside of Aix-en-Provence about 15 kilometers, Ventabren is a picturesque "village perché," (hillside village) with an interesting ruined castle. In its unique situation, high above the Valley of the Arc, this little village perfectly portrays what is meant by the term perché: like a bird perched high up in a tree. There is a magnificent 180-degree view from the castle ruins over the idyllic landscape to the north of the Etang de Berre and Martigues, on the southern bank of the river. The village also has a noteworthy 11th-12th century parish church dedicated to Saint Denis. A few kilometers south of Ventabren, along the charming Valley of the Arc, is the Roquefavour Aqueduct. This imposing three-story structure conveys the Durance Canal over the valley towards Marseilles. The aqueduct was built between 1842 and 1847 and has a perfect construction that offers a powerful visual effect. The upper level of the aqueduct is accessible from the D64 highway coming from Ventabren, taking the first left turn towards Petit Rigoués just before reaching the D65 highway, and then a right turn at the watchman's house. Just a 30-kilometer drive from Aix-en-Provence, the Château d'Ansouis gives visitors the sense of being transported back in time. The 12th-century château was an important medieval military fortress, standing in its glorious location overlooking the Aygues Valley. The château is decorated in authentic furnishings that evoke the styles of historic eras, offering a realistic impression of what it was like to live here throughout the centuries. The grounds around the château are also spectacular. Fitted along terraces below the château are a series of lush gardens that feature superb panoramas of the Alps in the distance. Immaculately landscaped and maintained, the gardens are designed in perfect harmony with the scenery. Built up along the banks of the Durance River in a splendid natural setting, this medieval town (100 kilometers north of Aix-en-Provence) has a rich cultural heritage. The history is evident in the atmospheric ancient streets, ornate 16th- and 17th-century houses, and a medieval cathedral built between 1160 and 1220. Sisteron also has an extraordinary citadel, perched high on a hilltop and surrounded by ramparts. Classified as a historic monument, the citadel is open for visits daily, offers guided tours, and features temporary art exhibits. In July and August, the citadel's open-air theater becomes a venue for "Les Nuits de la Citadelle," a festival of musical concerts, theater, and dance performances. During summertime, the area around Sisteron is popular for camping and outdoor activities such as swimming, canoeing, kayaking, and river rafting. In season, the tributaries and lakes around Sisteron provide opportunities to catch salmon as well as other fish. Aix-en-Provence is at the heart of Provence, a region brimming with fascinating historic towns and quaint medieval villages. It's also close to many other top tourist destinations in southern France, including the glamorous resorts of the French Riviera, the stunning Gorges du Verdon in Provence, and the picture-perfect hilltop villages of the Luberon. Most first-time visitors to the area also travel to Avignon to see the UNESCO-listed Palais de Papes and to Arles, a lovely town renowned for its captivating Provençal ambience, landmarks painted by Vincent van Gogh, and impressive classical-era monuments. Another nearby town with amazing ancient Roman buildings is Nîmes, which is slightly farther off the beaten tourist path. For a taste of Provençal urban life, Marseilles (only 30 kilometers south of Aix-en-Provence) offers the buzzing atmosphere and cosmopolitan culture of a Mediterranean port town. To journey away from the cities into the charming Provençal countryside, the Haut-Vaucluse is within reasonable driving distance. This sleepy pastoral region delights visitors with its sensational sun-drenched landscape, undiscovered rural towns, and picturesque hilltop villages. To discover charming villages, nature sites, and glamorous resorts around Aix-en-Provence, the easiest option is to take organized day trips led by knowledgeable guides. The travel arrangements are by luxury minivan, so tourists can relax and enjoy the scenery during the ride. Visit the Luberon's Charming Villages: Spend an entire day exploring the quaint medieval villages of the Luberon region in Provence. These enchanting little villages are perched high on hilltops, surrounded by lavender fields or built up around canals. The Luberon Villages Day Trip from Aix-en-Provence is a nine-hour guided driving tour that stops at the villages of Lourmarin, Bonnieux, Isle-sur-Sorgue, Roussillon, and Gordes. Each village has its unique charm and fascinating historic sites. Many villages have traditional Provençal markets and inviting boutiques that sell artisanal products. Explore the Gorges du Verdon Nature Site: One of Provence's most stunning natural wonders, the Gorges du Verdon is part of the Parc Naturel Régional du Verdon (Natural Regional Park of Verdon). Travelers seeking a refreshing change of environment will enjoy the Verdon Gorge and Moustiers Ste-Marie Tour from Aix-en-Provence. This nine-hour driving tour takes tourists through the breathtaking landscape of the Gorges du Verdon with stops at the nearby L'Occitane cosmetics factory and the beautiful village of Moustiers Sainte-Marie. Tour the Glamorous Resorts of the French Riviera: For many tourists on holiday in southern France, the French Riviera is a must-see destination. Also known as the Côte d'Azur because of its deep blue sea, this dreamy stretch of coastline boasts fabulous beaches, excellent art museums, and attractive seaside towns. The French Riviera Tour from Aix-en-Provence includes visits to three popular spots on the Côte d'Azur: the glittering principality of Monaco; the well-preserved medieval village of Eze, on the way to Nice; and the gorgeous city of Nice, with its sensational Mediterranean views and palm-fringed waterfront promenade.